This is a 17" tall Fantasy football trophy. 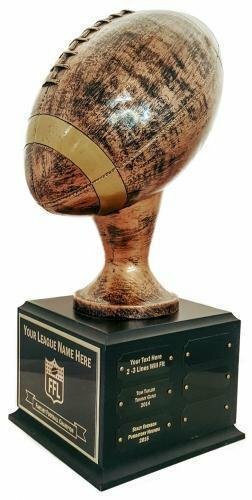 The trophy has a pressboard base (7" Square), painted black, with an Antique Bronze Finished Resin Football. Includes header plate personalized with your league info. Comes with 18 individual plates for annual updates. Engraving of individual plates not included. See customization options when you add to cart to view plate and engraving options.